Since, in 1978, Kernigham & Ritchie published the "bible" for the programming language C, every programmer has to start with "Hello World". This means, whenever you learn a (new) programming language, you should write an application that displays "Hello World" on the screen. We should stick to this tradition! I am not a professonal programmer - do not expect great wonders, just small miracles. You will see that the operating system I spent a lot of time with is EPOC32 (www.symbian.com). EPOC32 was used on the following PDAs: Psion Series 5 (mx, mx pro), Psion Revo. Mako, Diamond, Oregon, and the new Nokia Communicator and Ericsson/Sony "smartphones". Nowadays, me and members of my research group are predominantly programming in the Linux environment with Python, AWK and PHP. Some recent fun is writing stuff for Garmin Wearables like the Vivoactive, Forerunner or Fenix series. As part of the CyanoFactory Research Consortium we are developing a knowledgebase and design software. 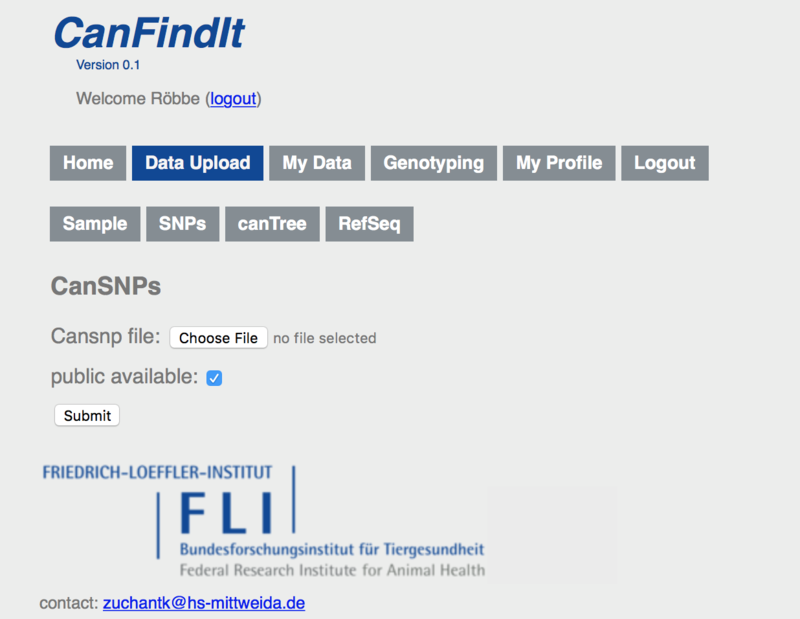 The Canonical SNP Finder will facilitate the fast allocation of genotypes to an existing distance tree. 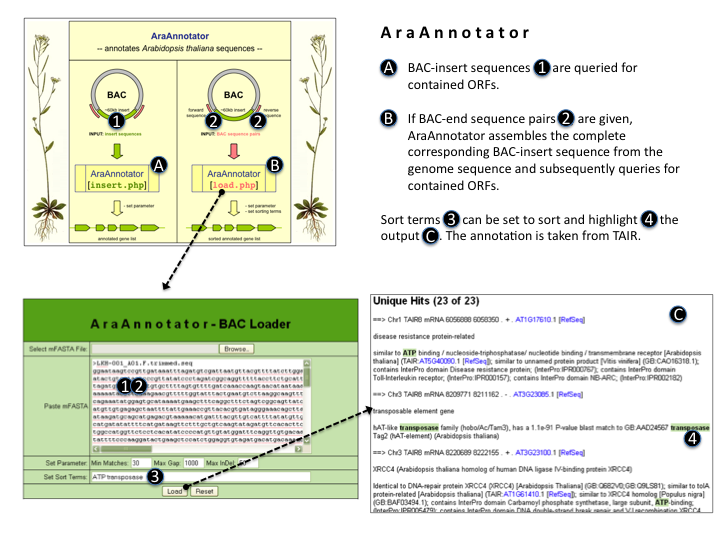 The web-application AraAnnotator helps scientists to annotate fully or 5'/3'-end sequenced BAC libraries of Arabidopsis thaliana. In principle, the annotation of any sequence is possible after some software modifications. With the help of user supplied keyword, the annotation result can be sorted. The sort terms are highlighted. The software is available upon request. Nutrilyzer is a web-based application for the discovery of significantly different expressed gene product with significantly different atomic side chain composition. 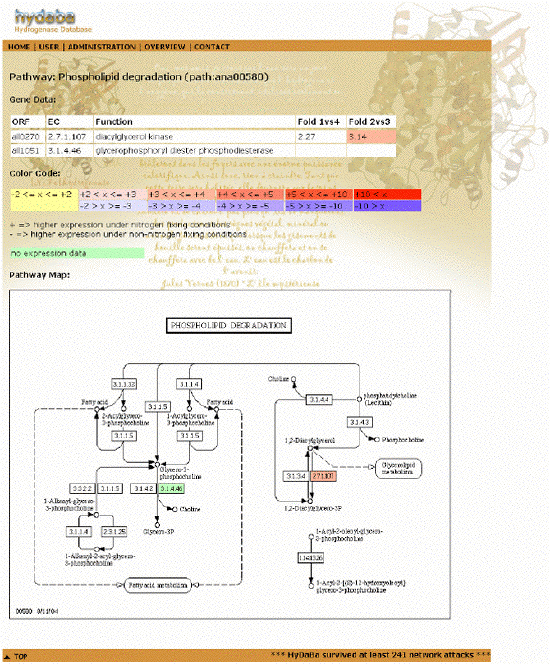 We use for our project on proteome evolution. 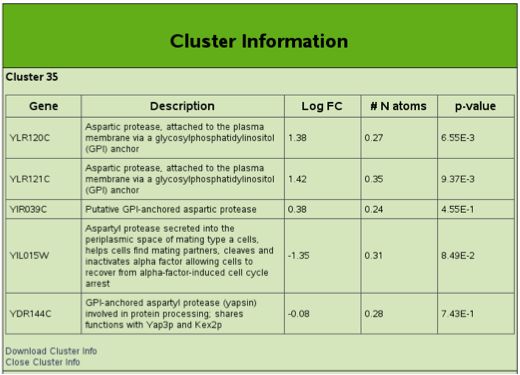 The following screenshot show details for one result cluster. Check out Nutrilyzer. Download Nutrilyzer. For certain analyses it is extremly helpful to cluster protein or nucleotide sequences hierachically and display the resulting tree. 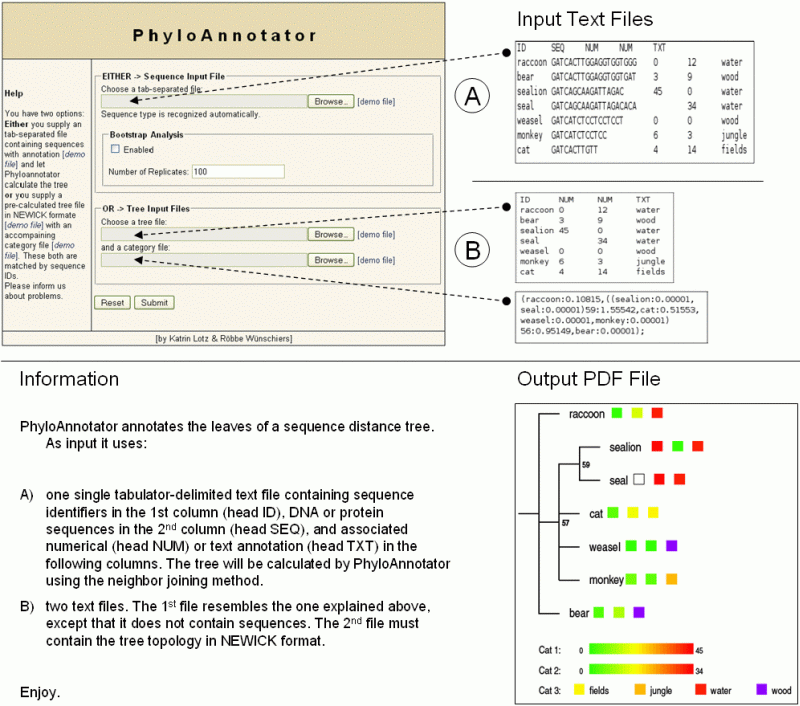 PhyloAnnotator allows to annotate such trees with meta-data as depicted below. In my group we are experimenting with the application of formal concept analysis to biological metadata. My Diploma student Sebastian Breuers implemented a luxury software which is available at SourceForge. 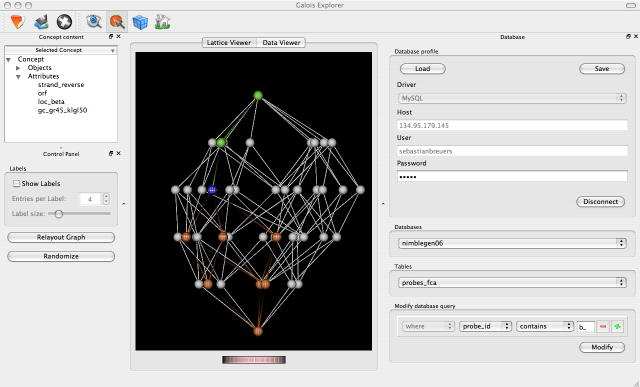 It provides a user-friendly interface for basic functionalities of formal concept analysis with different lattice generation algorithms and an interactive viewer to explore a 3-dimensionally laid out lattice. When performing gene-expression analysis with DNA-microarrays, an important step is probe design. 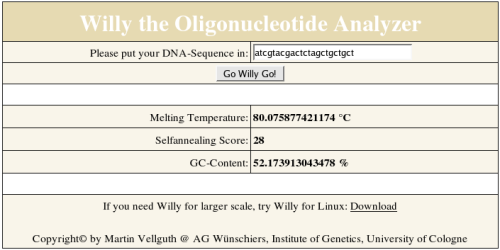 We are currently using a home brew software tool to test oligonucleotides for self annealing, melting temperature, and GC-content. 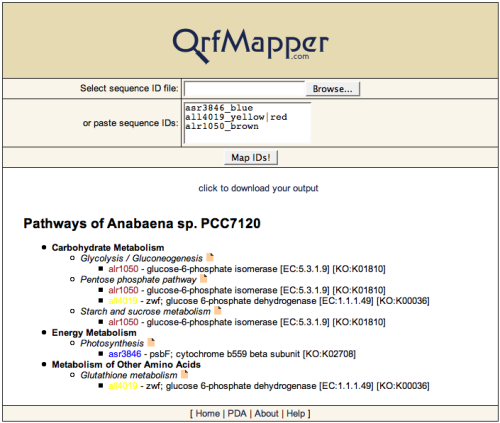 For the visualization of genes on KEGG-maps we created a tool called OrfMapper. It accepts a wide range of organisms and requires a white space delimited input file. The first column should contain gene identifiers while the second column should contain a plain text color code. OrfMapper is currently sleeping in a backup and waits for somebody to wake it up and refresh it. 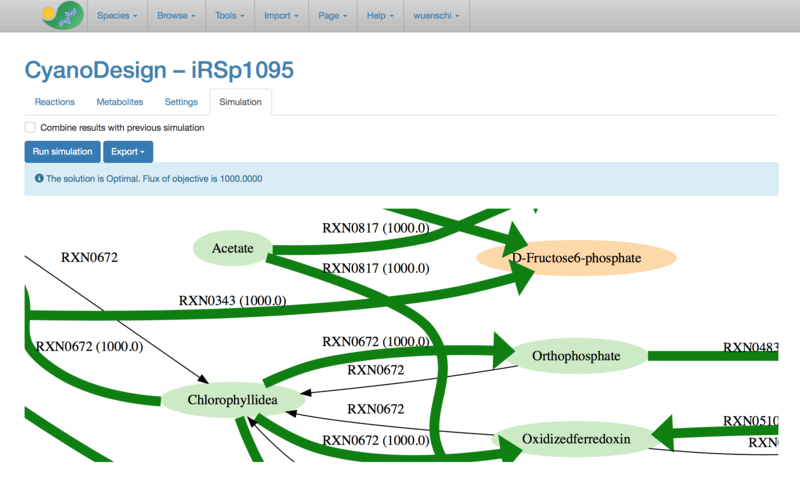 Another import tool for my research is the Hydrogenase DataBase Suite, which allows analysis of gene-expression data and overlays the data onto metabolic pathway maps. HyDaBa is currently sleeping in a backup and waits for somebody to wake it up and refresh it. Freely available are my contributions for Garmin wearables. 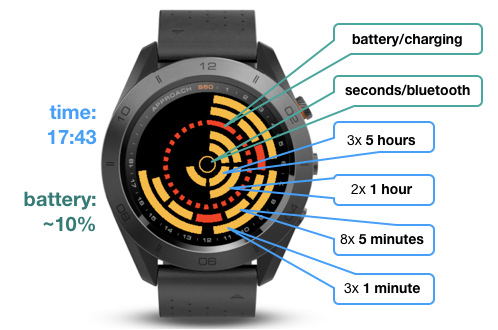 I implemented a) an extended version of the Berlin Clock (see below) as a watch face, b) the same principle but circular, c) an hour glass application for boiling eggs, and d) a data field to visualise pace during running. The ColorPace data field gives the running average pace over a period of seconds (preset to 10sec) that can be set by the user. The background of the data field changes according to set minimum and maximum pace. Above the maximum (to fast; preset to 4:30 min/km) the background is red, within the boundaries it is green, and below minimum pace (to slow; preset to 5:00 min/km) it is yellow. Before activity recording the current pace (upper left), the averaging time-window (seconds; lower left), the slow pace boundary (upper right), and the fast pace boundary (lower right) are shown. 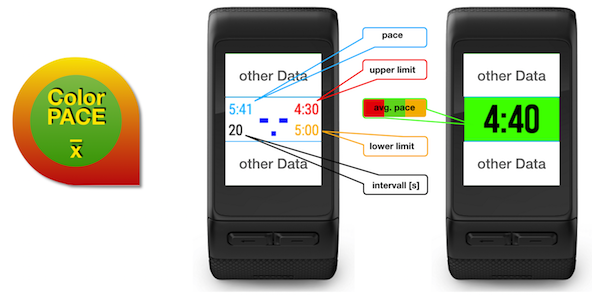 During activity recording only the averaged pace is shown. Preset values can be changed within Garmin Express on your desktop or Garmin Connect on your mobile device. The values are displayed based on the settings as either minutes per mile or minutes per kilometre. With this watch face I converted the Berlin-Clock to a circular design. The countdown app is preset to 6:30 minutes. Touching the screen pauses and resumes the countdown. The left button resets the timer. Short vibrations mark the final 60, 30, 10 and 5 seconds. The timer is optimised for bringing fridge cold eggs into boiling water at sea level. 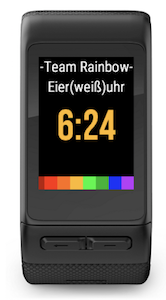 The "Team Regenbogen" (rainbow) is a triathlon relay I am part of. If you like to use any of these programs on the Nokia Communicator 9210 you must download the OPL Runtime from Symbian. Except for MeasureSuite, you will find all these programs (and many other software from Psion programmers) on the Psion II CD-ROM. This CD-ROM can be purchased in big book stores or from Psion. If you ever wanted to measure light, temperature, noise, voltage or any digital of analog signal anywhere with your mobile Psion 5/Revo or Mako - you will like MeasureSuite! MeasureSuite is a program will read data from an analog-to-digital converter (ADC) connected to the serial port (RS232). MeasureSuite was designed to work with the ADC "Umweltspion" from the company AK-Modulbus GmbH. This AD-Converter has a build in temperature, light, and noise sensor. The program displays temperature, light, noise, voltage (0-4V) or resistance and the state of a digital input. These data are also written into a text file, which can either be processed with the build in spreadsheet application or transferred to the PC. NOTE: For testing the program without the analog-to-digital converter it has a simulation mode. ToastMaster is a program for the Psion 5/Revo and Mako that will help you giving toasts, seminar talks or speeches. In a way it is an oral presentation manager. The information on the Presentation Screen will guide you smoothly through your presentation and you must not worry any more to mess up your paper notes, miss the line or forget to mention something during your talk - relax and enjoy yourself! This is how it works: You prepare a list of terms (words) in Psions Word application or any text edito and save it as a text file. Now you start ToastMaster and import the text file into the program. A full screen will open (see above) and all you do is scroll through your list of words (using the arrow keys). The active word, as well as the time and the number of words are shown in large fonts. You can nicely see it. In smaller fonts the previous and next words and the file opened are displayed. This animation shows the introduction and the main screen. That is it! You can download a zip-file containing the above list in Text, Psion Word, and ToastMaster format. GeoGrid for Psion Series 5 calculates the grid reference from a geographical position you enter as Deg°Min'Sec'' latitude and longitude, respectively. Furthermore, it shows the position on a earth map. GeoGrid also contains a editable database with presently over 800 cities. You can search the database for a city, which will then be shown on the earth map with its corresponding coordinates. The database can be edited and supplemented from within the application. Alternatively, you can pick a location on the screen using the pointer pen. Version 2.0 incudes the following grid references: British Isles (Airy Ellipsoid); Finnish KKJ International Ellipsoid (Zone 1-4); Ireland (modified Airy Ellipsoid); Sweden (RT90); UTM (International & WGS84 Ellipsoids). This is the intro screen. This animation displays some input windows. This animation shows the different menu items. It is hard to think of reading the newspaper without being confronted with scientific terms from the world of biotechnology nowadays. My project of providing a glossary aims to help you. I need your feedback to get thinks simpler but not wrong! Please email me. Presently, the glossary contains 568 entries of the world of biotechnology (version 1.2). The database is also available in the TomeRaider database format (Download: biotech.tr, 48kb). Contact me if you like to have a version for the Psion 3. TomeRaider is a database file viewer available for Windows, WindowsCE, PalmOS, and EPOC. The author likes to thank PalmTec, the distributer of TomeRaider, for generous donation and support. TomeRaider datafiles (like the free Webster Encyclopedia) can be found at www.memoware.com. The Berlin-Uhr for the Psion 5/Revo and Mako is a registered trademark by D. Binninger who invented it in the seventies. It was originally installed in 1975 at the Kurfürstendamm in Berlin. Due to technical problems and the running costs of roughly 5000 Euro the clock was switched off in 1995. One year later the clock was reinstalled close to the Europa Center in front of the tourist information and is presently sponsored by merchants within the Europa Center. The Berlin-Uhr is based on the principles of quantity didactics and with this its the first of its kind. The time is calculated by adding the lit rectangular lamps. The top lamp is blinking in the rhythm of the seconds. The upper row of four lamps represent 5 hours each. The four lamps in the row below indicate one full hour each. Three burning lamps in the first row and three in the second account for (5+5+5+1+1+1) 18 hours, which is 6pm. The third row of eleven tall lamps represent 5 minutes. 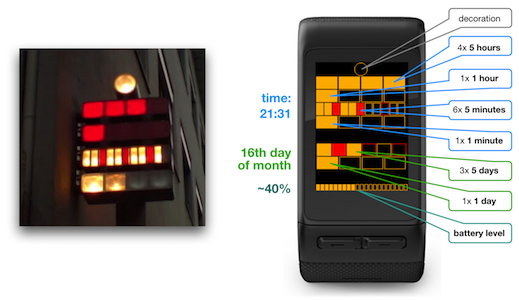 In the original version of the clock the 3rd, 6th, and 9th are red colored indicating the quarter hours where as the other lamps are yellow (Implemented with grey in version 1.1). In the last row every lamp represents 1 minute. ...on the Psion Series 5 (version 1.0). ...on the Psion Revo (version 1.1r; picture: C. Worms). Buffers are intensively used in Chemistry, Biochemistry and molecular biology to maintain a preset pH value in a aqueous solution. Yet, the buffer properties are influenced by not only by the buffer substance but as well by the temperature, the ionic strength of the solution and other parameters. TheRealBuffer for the Psion 5/Revo and Mako takes this into consideration and calculates the amount of buffer substance to use and how to titrate. It uses a database containing the most common buffer substances used, and which can be altered by the user. rwMeasureSuite for Windows 9x/Me/NT/2000/XP can only be used with the analog-to-digital converter "Umweltspion" from the company "AK Modulbus GmbH". The software reads voltage, temperature and light intensity data from the AD-converter and exports the data into a text file. The AD-converter must be connected to the serial port COM1. Proper connection will be prompted by a beep signal at program start. Read the instructions of the AD-converter how use the plug for the voltage input. The light and temperature sensor is integrated in the AD-converter module. To test the program you can sample nonsense data without the AD-converter connected.The maximum sampling rate is 0.5 seconds. Contact me if you like to use the program. Depending on your operating system installation you might need to download the MSVBVM60.DLL, which I provide here in zipped archive. Simply unzip the file into your Windows\System folder. This folder goes by several names on different systems. It may be called Windows\System32, Win95\System32, WinNT\System32 or any of these without the "32" at the end (if you have both, choose the folder with the "32" at the end.